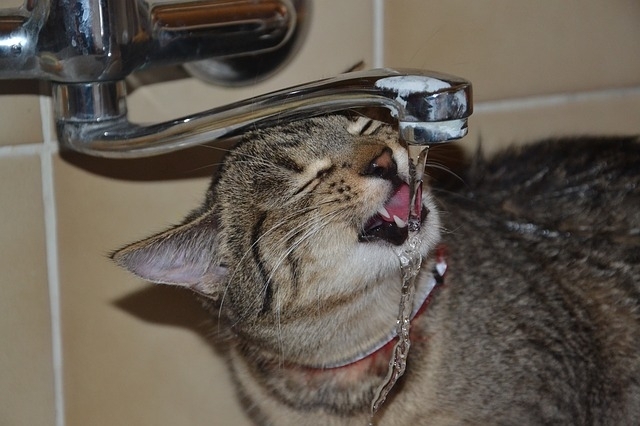 Water is the most essential nutrient for all living things, including cats. Healthy cats generally meet their water intake needs through a combination of drinking water, and consuming water present in foods. Maximizing water intake is an important step in the treatment and prevention of several common illnesses such as obesity, kidney disease, and bladder stones. How can you go about getting your cat to drink more water? One of the easiest ways to get your cat to consume more water is to feed them canned foods, which typically contain 65-70% more moisture than dry foods. Cats who eat mostly canned food will meet almost all of their water intake needs. If feeding a canned food only diet sounds too expensive, try offering one canned meal daily. As long as your cat is slim, you can leave dry food out during the day to provide any extra calories they may need. Don't force your cat to hunt for water. Always ensure that there are several sources of fresh water available throughout your home so that it is always accessible. This is especially important if your cat has limited mobility. Refill containers with fresh water daily, and wash them with hot, soapy water at least once a week. Sometimes a cat's fluid intake needs exceed their ability to take in water orally. This happens most frequently when the kidneys can no longer conserve water, resulting in the production of large amounts of diluted urine, dehydration, and electrolyte imbalances. In cases like these, intermittent doses of fluid underneath the skin can quite literally save lives. This procedure is easy to learn, and many cats are quite cooperative, almost understand that these fluids are what make them feel better. Talk to your veterinarian if you think your cat could benefit from subcutaneous fluid therapy or if you have any other questions about how much your cat is, or should be drinking.